AMS endorses the Physician Charter developed by the American Board of Internal Medicine (ABIM), American College of Physicians-American Society of Internal Medicine (ACP-ASIM) and European Federation of Internal Medicine. Please click on the above image to view the Full Charter or click here. 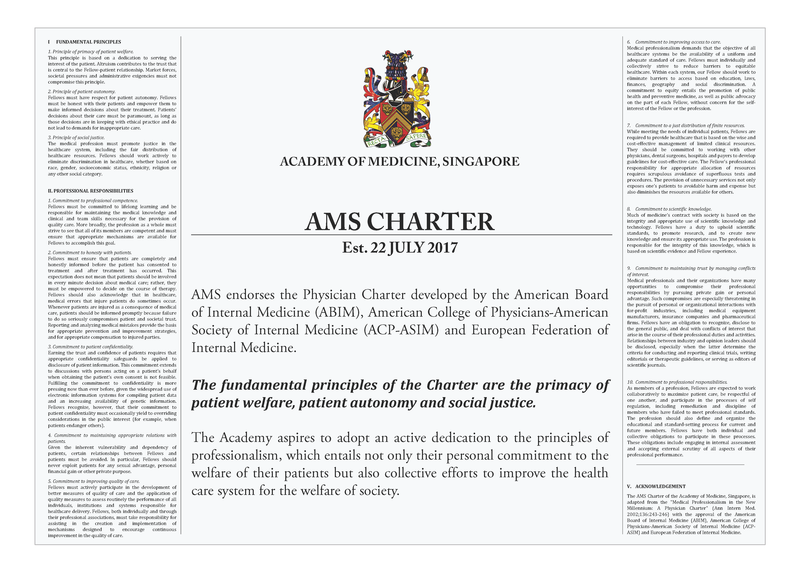 The AMS Charter of the Academy of Medicine, Singapore, is adapted from the "Medical Professionalism in the New Millennium: A Physician Charter" (Ann Intern Med. 2002;136:243-246) with the approval of the American Board of Internal Medicine (ABIM), American College of Physicians-American Society of Internal Medicine (ACP-ASIM) and European Federation of Internal Medicine.